The Catholic Church has said that the primary faith educators of children and teenagers are their parents. In 2004 findings from the National Study of Youth & Religion, found that more than anything else parents positively or negatively impacted the faith practice of their teenager. Parents teach their children how to be Catholic every day, whether they are trying to or not. HNOJ Youth Ministry seeks to partner with parents to help grow this next generation of young people into lifelong disciples of Jesus Christ and participants in the life and ministry of the Church. We want to continue to be in conversation with parents to make sure we are doing everything we can to support parents and families in raising Catholic kids. Here are 3 ways we would like to partner with parents to accomplish this goal. We can only minister to where we can go. One place we can’t go is a teenager’s heart. There only God can venture, and so we pray. We invite you to pray these short prayers every day for our teens and our ministry. God, our Father, we thank you for the blessing of the teenagers in our lives. Give them all that they need to grow as Christian disciples. Give us all we need to more perfectly model love for You. Holy Spirit come and bless our teens that they may know, love, and serve you every day of their lives. Jesus Christ, thank you for a parish community that seeks to love, grow, and support teenagers as young Catholics. Bless the community, all who come in contact with our teens, with the grace, perseverance, and love to call our teens into a deeper relationship with God and fuller participation in the Church. Parenting teens is full of the greatest of joys and the most difficult of lows. Here are two things that many parents have found help in sharing faith with their teenage children. Don’t miss Mass. If nothing else happens, and even if they slouch their way through, going to Mass as a family is a vital to passing on the faith to the next generation. Make attending Mass weekly something your teens do now, and they have a better chance of doing it later. Skip it, and they have almost no chance of attending as young adults. We know, they are probably going to roll their eyes, but behind each of those eye rolls, is a teenager learning what is important to their parents. If you talk about your faith, pray as a family, and never let a decision go by without involving your faith, your teens will notice. We have to explicitly teach our teens that we really do pray, believe, and practice this Catholic Faith. Concerned, loving, and real adults are needed to show teens that this faith is for everyone. Here are two ways to help at HNOJ. 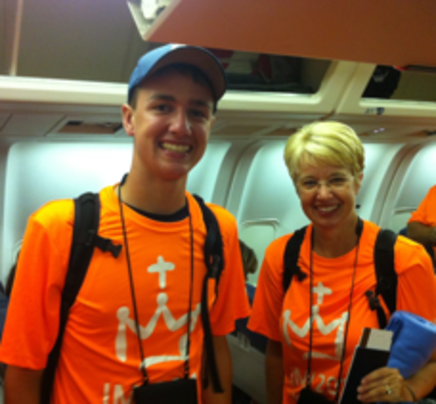 Your teen loves retreats or mission trips or class or hanging in the youth lounge. Tell other parents. Spread the word. Sometimes parents even conspire to get their kids to attend an event together. We give you permission to collude with other parents to put kids in front of Jesus. Confirmation: Parents lead small groups and prep their teens.